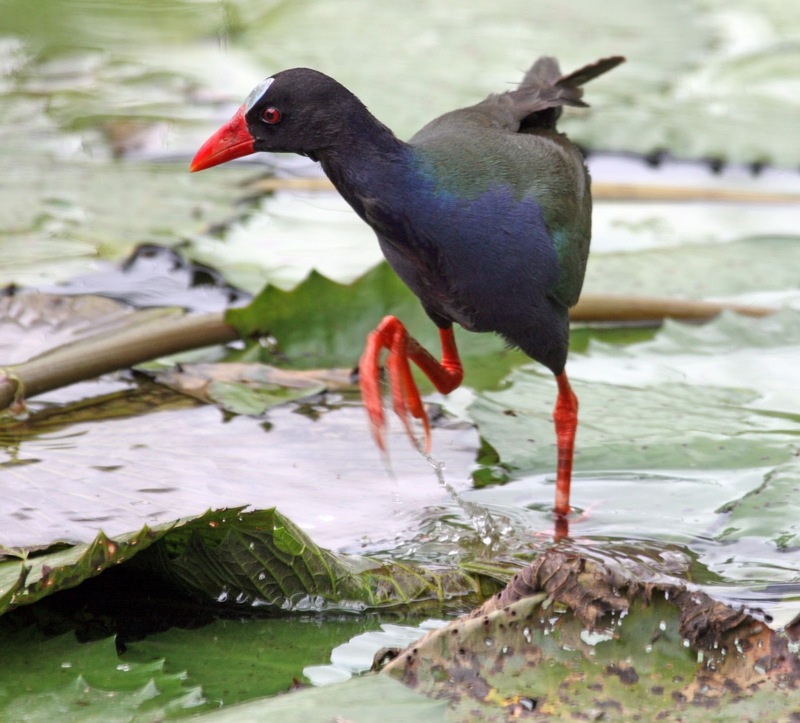 We’d heard that Leeupan, an ephemeral pan, someway north of Skukuza in South Africa’s Kruger National Park, was the temporary home for a family of African Pygmy Goose & an Allen’s Gallinule. We needed both for the challenge but we were neither concerned nor in a hurry to make the trip. Both species are readily common elsewhere. That all changed, however, rather abruptly, as soon as we’d processed another reliable reporting of River Warbler in & or near Lower Sabie, east of Skukuza. River Warbler is a drab sod; largely nondescript and a skulking species, more common under the right conditions than the manual admits. It’s also our bogey-bird, bar none; a veritable nemesis! We’ve dipped on R. Warbler too often to accurately recall and we have, for all intent & purposes, elevated this master of stealth to virtual mythical status. First order of business, African Pygmy Goose & Allen’s Gallinule. Those who know these things will claim that assumption is usually the mother of the proverbial.. I must admit I hadn’t lost any sleep contemplating the possibility of dipping on all three species. Nevertheless, some two hours after first arriving at Leeupan we were, in fact, facing the almost farcical proposition of dipping on all three. Sheer luck, a cavorting hippo and a generous dose of perseverance, akin a Bieber-stalker, put us on both the geese & the gallinule. Flushed from their ‘twitcher-shelters‘ on the far side of the pan, both the goose party (8 goslings) and the gallinule spent a short while in full view, in close proximity and on our side of the pool. Veni, vedi, vice! In the time we took over two scones & a cup of tea we had to concede that the two birds reported in camp were conspicuously silent .. Faced with a pensive foreboding & a prudent sense of deja vu, we exited camp, a tad glum & turned west. Precisely 2.3 km westward on the H4-1 & at 6:15 am; a little way down the immediate bank of the Sabi river – the once-heard, never-forgotten call of a male River Warbler.. Suffice to say we spent the next two hours holding vigil and for our years of pain & suffering and the repeated iterations to bemused Big-5 adventurers of ‘ag nee, it’s only a bird...’ we were rewarded with 4 incredible sightings of the same individual! Forget playback. It doesn’t work. From our elevated view here’s what we observed. For those who don’t know this bird spends most of its time on the ground, in the thickest muck imaginable. After a brief bout of calling, mid-bush (1 meter or so above ground level) the bird would free-dive vertically, head-foremost & bungee-like to ground level where it would disappear from view for a variable time before returning to the same perch to call and repeat the process. This he did four times over the next two hours. Truly amazing. It’s difficult to describe our emotions – surely elation; some relief & perhaps too, a small measure of sadness, a contradiction in terms if ever there was. The mystique, fragile & the myth disrobed! For ten years we’d been led a merry dance; the steps of which had proved, ’till now, too painful to accept. We’d been weighed, measured & found wanting! A drab sod no more… What a beauty!